Troyer Contracting Company was formerly known as D.V. Troyer Company. 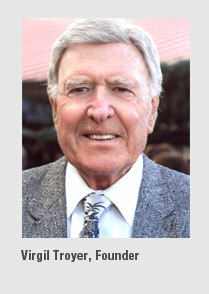 Virgil Troyer (founder) started in the architectural sales business in the early 1960s. Virgil soon became known as a waterproofing expert. In 1964 Virgil sold the first Bentonite waterproofing system for a shored-foundation construction in Los Angeles. At that time, this type of waterproofing system was innovative. In 1975 Virgil’s son Mark went to work for a local elastomeric coating manufacturer who installed their own products. In 1979 Mark came to D.V. Troyer to manage the contracting division. The contracting division soon became the growth of the company and in 1995 the division became Troyer Contracting Company. The name Troyer has since become synonymous with the words Roofing and Waterproofing. The company strives to maintain the integrity instilled by its founder. Troyer Contracting will continue to maintain strong and controlled growth. The philosophy at Troyer is to maintain this growth without compromising our reputation for quality and service to our clients.